Ride a bike (we have childrens’ bikes). Play table football, table tennis or badminton. There are games and art supplies and there is unlimited WiFi. 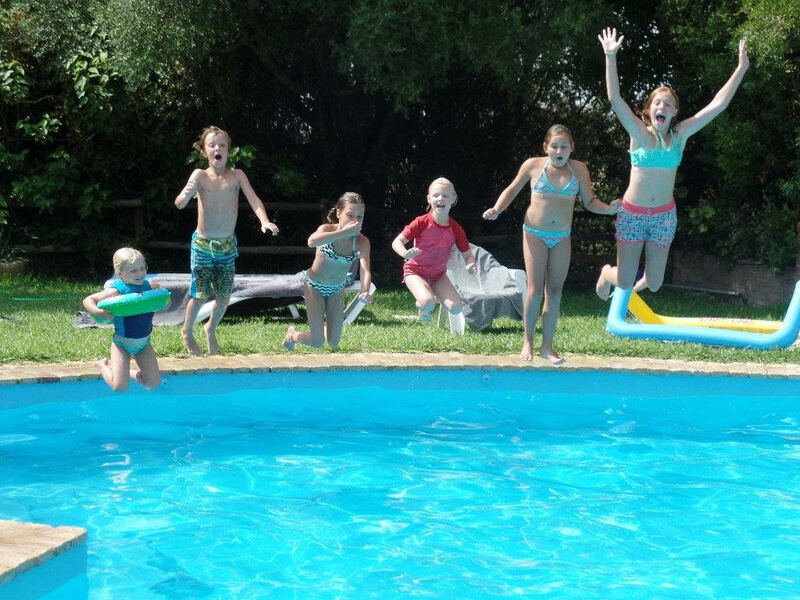 Our kids, Juliëtte, Luuk and Jesse like to play together in and around the B&B. Enjoy cycling on the famous cycle route, Via Verde de la Sierra, where you cycle through mountain scenery without having to climb uphill. Ideal! Halfway up you can visit the vulture information centre. In Coripe you can rent a type of family bike with a roof on top. They also have bikes with an infant seat or infant carts to tow behind and also kids bikes. Read more about the route and cycling the Via Verde with children. Walk the Rio Majaceite. We absolutely recommend this lovely, shady walk. The walk from El Bosque to Benamahoma is about 5 kilometres. It goes alongside the river, through the woods, over bridges and up and down many steps. Not difficult, and very nice for the whole family! You might even see an otter. Zahara de la Sierra (40 min) is a white village located near an azure-blue lake. You can climb all the way to the castle. Nice route and you will be rewarded with a beautiful view. Visit Playita Aroyomolinos, a small oasis where you can swim in the refreshing mountain water. There are lots of trees, 6 hectares of lawn, a sandbox, picnic tables and a bar and restaurant. At the weekend it can be very busy but sitting amongst the locals also has its charms! The beach at Arcos de la Frontera has a lovely sandy beach with wonderful sweet water and no waves, so very child-friendly. There are also many shady spots. Here you can rent a canoe or boat. A day at sea. We know a lovely child-friendly bay, Playa de la Muralla at El Puerto de Santa Maria. At El Mogote you can rent a water bike with a slide. Great for the children and relaxing for the parents. There are also canoes for rent. Then have a nice lunch at the restaurant which has the relaxed atmosphere of a beach pavilion and enjoy the magnificent views at Zahara de la Sierra. The perfect way to spend a vacation with your children! Our “neighbours” will give you a guided tour of their olive oil factory where the old craft is combined with state-of-the-art technology. Interesting for parents and children. We always say: “In Catholic Spain, Dios may come first, but the children are a close second”. Experience a Flamenco performance in a tiny theater (28 chairs) where they also have performances in the afternoon. It is situated in a covered market hall in the Triana quarter (the glazed tile district). On Sunday morning there is also a lively artists’ market along the river. Have a portrait done of your child(ren). You should also walk on top of the Metropool Parasol (the modern mushroom). The unusual wooden construction is quite in contrast with the surrounding monuments of the old city. You can also use the 3D glasses from PastView (takes half an hour). This shows how Seville was in the olden days. Really interesting for parents and children! At the Bullring and adjoining museum you can learn about the customs of this ancient tradition in southern Spain. The number one attraction of Seville is the Alcázar (the Moorish palace) and you should climb the Giralda (old high tower). Bear in mind that it’s huge and you can easily spend a number of hours there. Visit the romantic Plaza de España in the Maria Luisa park. Discover the history of the architecture and admire the intricately illustrated ceramic tiles. The park itself has been inspired by Moorish architecture and features many fountains, ponds, orange and palm trees. Ideal for a picnic. Plaza Hercules de Alamenda is a huge square with playgrounds and fountains bustling with life. Here you can eat delicious tapas! Seville also has a number of amusement parks.
. Water slide park Aquapolis, Acuario, the aquarium where you can see sharks swim (something for a rainy day?) and Isla Magica, an amusement park with many water attractions. Visit the palace (Palacio del Virrey). The very charming marquis himself gives you a tour of the palace and tells you the special history of his family. The royal riding school (Real Escuela Andaluza del Arte Ecuestre) where the crème de la crème of equestrian sports can be found, is really worth a visit. Also interesting for people who are not really horse lovers. Horses and riders train here for the Olympic Games. 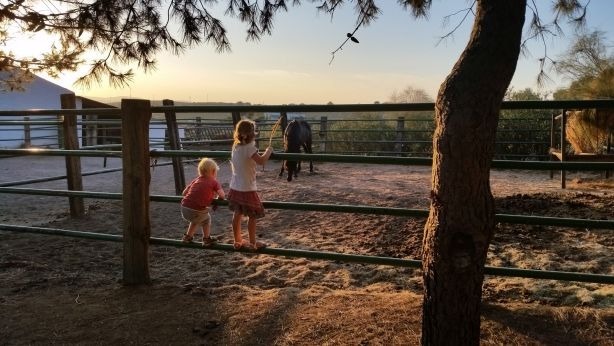 There are days when a spectacular show is on the agenda, and on other days you can take a guided tour and view the immense terrain with carriage museum, saddlery, stables, palaces, etc. Visit a bodega with a sherry tasting. Tio Pepe offers a train ride through the city and a guided tour through a bodega. Jerez de la Frontera also has a number of amusement parks. A water slide park, a large playground and a zoo. These are just a few ideas. We will gladly inform you of more when you are here. For this route you drive through la Sierra de Grazalema, a mountain chain with an area of 51,000 hectares. This protected nature park in Andalucia is wonderful to drive through. You will find spectacular views, picturesque white villages where time has stood still, kilometres of forests, rugged rocks and many hairpin bends. The perfect day trip from the B&B.